As concerns about air pollution from large dairies and other concentrated animal feeding operations (CAFOs) continue to mount, scientists are reporting a practice that could cut emissions of the abundant agricultural gas ammonia by up to 30 percent. BP Exploration Alaska Inc. will also implement a systemwide pipeline integrity management program for spilling more than 5,000 barrels of crude oil from the company’s pipelines on the North Slope of Alaska. The $25 million penalty is the largest per-barrel penalty to date for an oil spill. The rotational grazing technique, which has been adapted for a variety of livestock worldwide, calls for cattle to graze in small areas for shorter periods of time before moving onto other pastures. The U.S. Environmental Protection Agency is proposing stronger air toxics standards for secondary lead smelters, which would improve air quality and protect people’s health in communities where the smelters are located. NIST researchers have prototyped a framework to help organizations sort through the welter of choices and evaluate and implement sustainability standards most appropriate for their operations and interests. Researchers will study shale and tight-sand formations at the molecular level to understand how it moves through pores a few nanometers in size. Iowa State has developed a biorefinery simulator designed to help students in its biorenewable resources and technology program learn about biofuel production. Manufactured in Canada, the fibers are de-inked without the use of chlorine and the paper is made using renewable biogas energy. The project team analyzed projected costs over the next 20 years, looking at core smart grid technologies in transmission, substation, distribution, and customer interface. 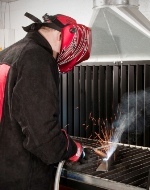 Manufacturers that use welding in their operations should get ready to meet this year's notification deadlines for Clean Air Act emission regulation. The Arizona Department of Environmental Quality settled air and water quality violations with the company at a cost of $312,000, part of which will pay for the company's environmental management system.